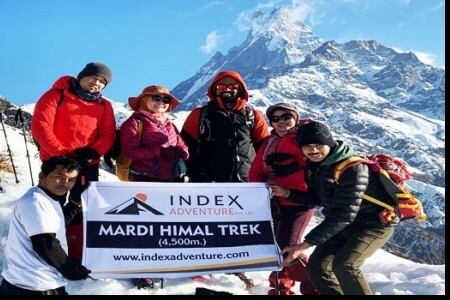 Annapurna Base Camp short trek is not only regarded as one of the most popular trekking packages in Nepal but also as one of the top trekking destinations in the world. The mighty mountain peaks that lie to the west of Annapurna are knitted like beads in a circular garland, with glacier lying at the center. 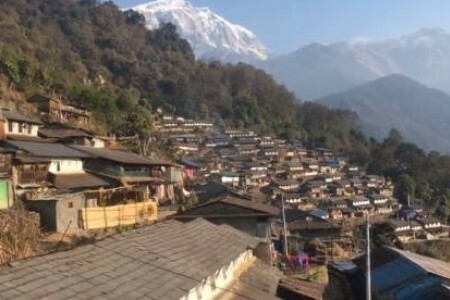 The warmth of local communities, spectacular 360-degree view of Himchuli and Annapurna, exotic flora-fauna and the rich culture are some of the assets of the trek. This route can be explored all year round, however, the trail is beyond beautiful during the spring season. 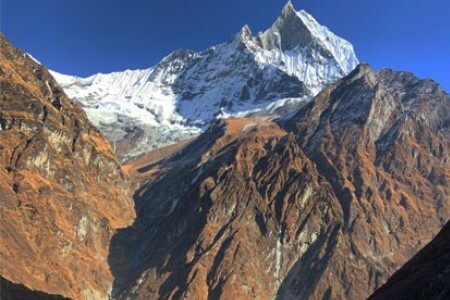 Annapurna Base Camp Short trek is an amazing trek to the lap of Annapurna ranges that you can ascend in a number of 11 days. This short trek to ABC allows you to explore the grandeur of the Annapurna ranges in the least days. Annapurna Base Camp trek takes you to the heart of Annapurna region where you get to enjoy the up-close views of Annapurna ranges, Mt. Fishtail, Nilgiri Himal, Gangapurna region, and other towering peaks. Along with mountain views, you will walk through many typical villages of different ethnic groups. Plus, you can explore the lush vegetation, flora, and fauna of the region. Autumn (September- November) and Spring (March-May) marks the peak season for trekking in the Annapurna region. 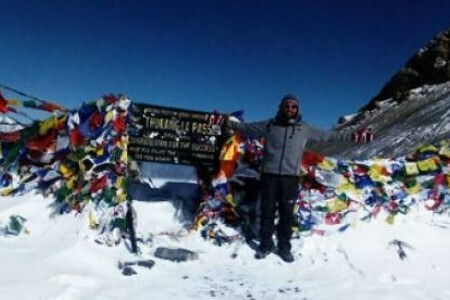 Best time to Annapurna Base Camp trek in these seasons offer you the best of the memories and the pleasurable time. These seasons offer the most moderate temperature along with stable weather conditions. So, you can do carefree trekking during these seasons without worrying about the rain, or snow or the slippery trails. Plus, the humidity is low in these seasons which means you will catch the sharpest and serene views of the surrounding landscapes and the mountainscapes. Whereas if you plan to trek in winter you may feel colder in the high altitude and the snowy trail may turn out to be slippery and difficult for you. While if you trek during the monsoon season then you may find the trails slippery with rain and mud. And, sometimes the dense fog may obstruct the visibility and you may get drenched in the rain. 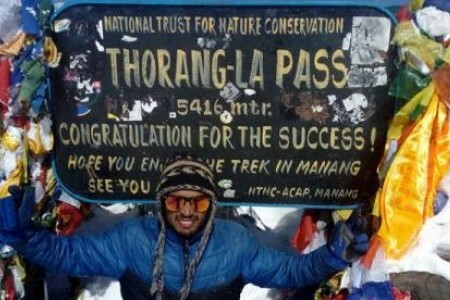 These are among the difficult months to trek in the trails of the Annapurna Base Camp. But if you pack List well, walk properly, and come physically and mentally prepared then walking to the ABC is no problem. Annapurna Base Camp trek difficulty is easily achievable to any trekkers who are physically fit and has packed properly for the trek. The trek takes you through the lush forests of rhododendrons and oaks alongside the rugged pathways. So, those who have not trekked on such remote area may feel the trail difficult. But if make good use of your trekking poles and walk slowly you can beat the trail difficulty. If you are habituated with the city life and are used to technologies, then you may feel difficult to adjust in the typical teahouses at the trek route. Because you will only get the basic facilities and you have to compromise on your sophisticated living. Also, since you will ascend to the largest height at 4130 meters, some may feel symptoms of altitude sickness on ascending further. But, with a little consideration on its preventive measures, you will have easy ascends with lesser risks. If you are trekking in the monsoon you may face leech bites and the slippery trails. Or, your winter trekking may see the snowy and slippery trails and colder surrounding. But if you trek slowly, cautiously with proper gears, then the difficulty of the Annapurna Base Camp is easily overcome. Both ways Local transports Pokhara-Kimche - Sewai - Pokhara. 2 Nights standards Hotel in Kathmandu with breakfast. 2 Nights standards Hotel in Pokhara with breakfast. Trekking lodge / Teahouse accommodations during the trek. 3 meals a day (Breakfast, Lunch, and Dinner) during the trek. Government Licensed Holder trekking guide with all his salary, food, drinks, accommodation, transport and insurance. Porter during the Trekking (1 Potter for 2 trekkers) with all his salary, food, drinks, accommodation, transport and insurance. Supporter guide group size above 8+ people. All necessary paperwork and entry permits (ACAP), Trekker’s Information Management System (TIMS) including local Tax, Government tax & official expenses. Sleeping bag, Duffel Bag & Down Jacket (if you do not have your own, to be returned after trip completion). 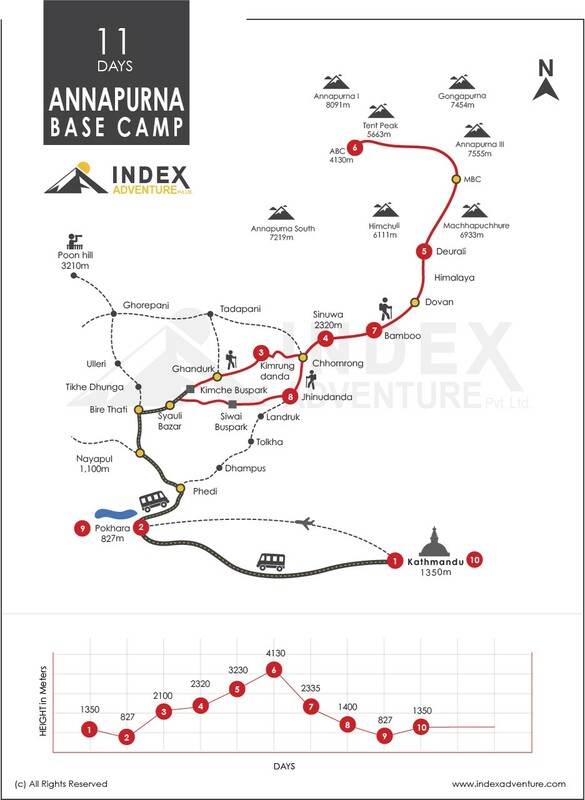 Index Adventure T-shirt & Trekking Achievement Certificate. Lunch and Dinner while you are in Kathmandu & Pokhara city. Extra night accommodation and meals if early departure from the mountain. Nepal visa fee (You can apply for Online or you can easily issue the visa on arrival at International Airport Kathmandu. Alcoholic and non-alcoholic hot and cold drinks & all desserts sweet things. Hot shower and battery charging in trekking Mountains. Any others expenses which are not mentioned in including section. Tips for the guide, porter, and driver (Tipping is voluntary). We experienced excellent costumer service by this company .in Kathmandu there are tons of adventure companies to choose but it can be hard to differentiate but we did this one certainly. The trip was incredible and at any moment if I needed to contact Keshab he would reply almost immediately. the agency was very friendly and patient, provided us with a lot of great information and ideas and together we planned a trek tailored to our specific needs (including scheduling specific rest days and places during the trek). The Guide and porter provided to us by the agency, they were accommodating, friendly and knowledgeable. He even had suggestions to make our trip more enjoyable and easier for us. I highly recommend this agency thank for you’re all helped for our dream to succeed Everest Base Camp Trekking. How to enter Nepal, via road ways or air ways? If you are travelling through air then you can only enter Nepal through Tribhuvan International Airport; is the only international airport in Nepal that operates several international flights on a daily basis. The airport is located in the capital city: Kathmandu, which is a popular hub for tourists visiting Nepal. From China: Rasuwagadi Border & Kodari Border. Do I need to get a visa, how I can get visa & what documents should I have with me during my Nepal visit? Yes! Except for the citizens of India, you need to get yourself a Nepalese visa to enter the territory of Nepal. If you are an Indian citizen a valid identity would be enough to enter Nepal via the entry points. Nepalese visa is easily available upon your arrival at any entry points (ref Q.N 1). Yes, you can get on arrival tourist Visa at Tribhuvan International Airport in Kathmandu there are some countries visa will needed $ 25 for 15 days, $ 40 for 30 days and $100 for 90 days tourist visa from the dates of issue.For Tourist Visa, you need to bring along your valid passport ( must be valid up to 6 months ,just in case extra photocopies of passport ) and few copies of passport sized photograph. Note: The resident of countries like Nigeria, Ghana, Afghanistan, Zimbabwe, Somalia, Cameroon, Swaziland, Iraq, Ethiopia, Liberia, Palestine do not get visa in the entry point of Nepal. 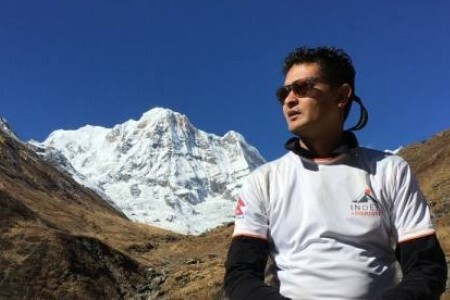 Is trekking and tour in Nepal is safe? Yes! Nepal is the safest country for the travelers around the world. Where and how can I exchange my currencies into Nepalese currencies? Upon your arrival, you can exchange your currencies at Tribhuvan International Airport but it might be low rate than other exchange places. However, banks do accept other countries' currencies too. All major banks of Nepal provide currency exchange services. Or the other option might be, exchanging your currency with the licensed money exchangers in major citieslike Kathmandu & Pokhara and mostof the commercial banks have ATM machines in major cities and towns of Nepal like Kathmandu and Pokhara where you will be able to withdraw money from your home country bank using your ATM card. Which is the best time of the year to trek in Nepal? Trekking in Nepal can be done anytimeof the year, except for monsoon. During monsoon (June-August), trekking becomes a bit difficult due to heavy rainfall and unpredictable weather. However, the best time of the year for trekking in Nepal lasts from month of March-May (Spring Season) and September-November (Autumn Season). What’s the difference between trekking, hiking, and mountain climbing? You will be able to do all these activities in Nepal, yet they completely differ from each other. Trekking is a multi-day walk where you stop at various destinations along the trail. Generally, hiking refers to one day walk up from 2 hours to eight hours which might be a one or two day event. 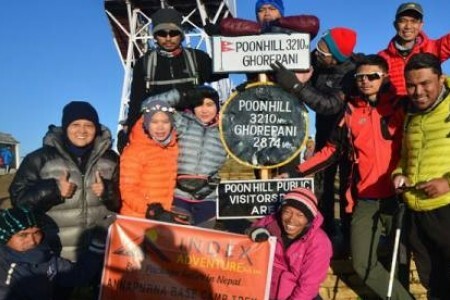 Mountain climbing is an adventurous activity which requires special gears and training, and is more risky than that of trekking and hiking as you climb the summit of mountain peak. What’s the climate like in Nepal? Will it be cold? This relies upon where you go and in which season you travel. Nepal has 3 different regions for climate where Himalayan region is mild cold in summer and freezing cold in winter, in Hilly region all whole year climate is suitable for travel but in Terai region the summer is very hot and in winter is too cold.Weather in the Himalayan region is unpredictable. Around the morning, evening and night, it normally gets cold yet the days are warm. Winter (December to February) will be bit colder however the days will still be very delightful and comfortably warm if the sun is out. There might be some snowfall during the winter in high elevation places. You should always carry some warm clothes while trekking in the higher elevations, whatever the season. What is the level of physical fitness required for an individual to trek in Nepal? One must possess a moderate level of physical fitness, past hiking experience, should not retain any chronic or subtle health issues especially in leg functions, and must be able to mentally adjust for multi-day treks in the remote areas. If you match all of the above criteria, then you are ready to trekking Nepal. How long & difficult would it likely take to complete a trek? The duration of your trek and the choice of the destination determines the difficulty and length. Generally, the duration lies from a minimum of 5 days to a maximum of 30 days or even more. This relies upon the Trekking route that you've chosen however; normally we will be walking close to five to six hours per day. There are different types of trekking grading from easy, moderate and changeling. What kind of trek is teahouse trekking and camping trekking? Tea house trekking refers to a trek where all your accommodation and meals are organized in a lodge/house with subtle services. Camping trekking is a trekking where we furnish you with tent settlement and full board with dinners to be cooked by proficient trekking cook in a versatile camp, outfitted with a kitchen and with satisfactory care staff of kitchen assistants, aides and porters. Are the meals and water available in lodges and camps hygienic trekking in Nepal? The meals and water available in lodges and camps are hygienic enough while trekking in Nepal.The predominant daily food of people in Nepal is lentil soup and curried vegetables with rice, typically called "Daal, Bhat,Tarkari” in Nepali. You might find the curries often spicy and oily which might bring out stomach problems to the foreigners. Along the Trekking trail will be simple, mix of local and international cuisine.Hence, we would suggest you to stick with normal, less spicy food. Another thing that one ought to know about while visiting Nepal is to drink packaged mineral water unless you are sure that the water is boiled, filtered or you can refine with water medicine tablets. I am a vegetarian. Will this create any problem in my dietary? Since there are numerous restaurants serving vegetarian foods in Nepal, there is no problem in being a veggie lover. You can easily get vegetarian food even when you enter normal restaurants. Should I hire a porter and guide and should I need to pay 'tips' them separately? If you want to make your trip considerably comfortable and hassle free, you ought to hire a porter or a guide. A porter will carry your belongings while a guide will lead you to your destination conveniently, and they aid you in any kind of emergency, so it would be an ideal decision to take a guide with you. Tips are highly expected by every porters and guides whom you go with. It is nice and acceptable way of saying thank you for their support and help during your whole journey. Normally, we suggest to tip around 10-20% of total trip cost. And, they feel happy when you pay tip in Nepali rupees because they felt difficulties to exchange while you pay them in your currencies. How safe is Nepal to travel? Nepal is the safest place to travel. Nepal lies in the safest place or destination for every foreigners who wants to travel Nepal. Travelers needs to fallow basic rules so that they can explore the Nepal freely. A reputed and legally register travel company used to organize and manage your whole trip. So there will be no any problem during your visit. During your long trip there will be one Nepali Guide with you and he/she will handle your all issues and tells you do's and don'ts during your visit. Some of the basic rules are listed below. Do not display your cash and expensive items. Ask your immediate queries with us and our representatives. Have your travel insurance and leave a copy to us. Leave a copy of your passports and other important document to us. Don’t hesitate to ask any questions to your travel planner and your travel partner. We are here to support you to make your travel memorable. You should fully believe on us. Can a solo female trekkers trek in Nepal? Firstly, Nepal is referred as one of the safest countries in the world, so Nepal indeed is safe for solo female Trekkers as well. Besides, while you're on one of our treks, we assume individual liability for your prosperity, a responsibility we regard genuinely. Is it a good idea to carry some medicine with me when I come to trekking in Nepal? Our Guides carry a Normal medicine & emergency First Aid Kit. But “Prevention is always better than cure”, so it is always a good idea to bring your personal medicines along with you when you come to Nepal. Despite the fact that there are numerous drug stores in Kathmandu, Chitwan, and Pokhara, and major cities of Nepal. It is highly suggested to carry some essential restorative stuff like insect repellent, sunscreen, lip balm, eye drops, and swathes etc. How will you support me if I suffer from altitude sickness or accident? There is high chances of getting altitude sickness while trekking above 3000m but there will be no worry because you will be taken care responsibly. Our guides are trained enough to handle this kind of situationIf the situation is harsh then guides promptly, moves you to a lower elevation first, and will be given medical aid as the quick treatment to recover. In case of emergencies the guide will take immediately action transfer to the nearby hospital utilizing your travel insurance. Remember to keep calm during such situations, also trust your guide, who is also trained in first aid. Do I need to get myself travel insurance trekking in Nepal? Yes! It is highly recommended to get a travel insurance before travelling to Nepal. Most of the travel insurance covers your emergency flights, medical expenses, and theft or loss of possessions but in the mean time while you are trekking in Nepal you should buy mountain helicopter evacuation insurance up 5500 m. We suggest you to buy insurance policy in your country because we don’t have mountain rescue insurance here in Nepal. Do I get the internet access? Normally, all hotels and restaurants in city grant access to free internet services to their guests.Since you will be in the mountainous region, Wi-Fi might not work everywhere or for many days. However, most of the guesthouses offer Wi-Fi for free or for a little charge. It is better not to rely on the internet and enjoy your trip. Else, you can use mobile internet after acquiring a Nepalese SIM cards like 'NTC SIM Cards' or 'NCELL SIM cards',in mountains until you get signal of Cello phone. Where I can purchase the NTC & NCELL SIM cards? Normally you can purchase SIM cards to use in your smart mobile phones in Kathmandu, Pokhara and other major cities too. To purchase SIM cards you need to provide a passport size photo and copy of your passport. It cost you very cheap to purchase such SIM cards. What things do I need to bring/carry during the trek in Nepal? Everything relies upon the time and elevation of your trek. However, if you are trekking on higher elevations, you should carry with yourself a down jacket and a pair of warm clothes. In other occasions, carry trekking jeans and shorts, sleeping bag, a pair of trekking boots, and camera and gears that you may require. Counsel a checklist of clothing and gears on our site, but remember to pack light clothes & gears. Normally, you need to carry a small day pack where you can put your light water proof jacket, 1 liter water bottle, sunglasses, cap/hat, your personal medicine and some money. A porter will carry your luggage, and you should pack your clothes and sleeping bag on plastics and keep into your rucksack which should be below 12 KG/25 pounds. In long days trek your luggage will kept back to hotel where you will came back after your trek. How much extra Money should I bring to go trekking in Nepal? Normally, you should bring extra money for alcoholic and soft drinks, hot shower, tipping for staffs and shopping around the trek. We suggest to you bringing $ 250 to $ 300 Dollars which you can change in different currencies converting outlets. In Kathmandu and Pokhara cities you can withdraw Nepali rupees from ATM’s Booths too, credit cards can be used to purchase expensive items but there is additional Charge for this service. Undeniably, Kathmandu city is the shopper’s paradise. One can treasure trove the real work of art and memento. Some of the most prevalent things that foreigners usually shop in Nepal are weaved garments, Tibetan carpets, pottery, mask and manikins, statues, Khukuri (traditional knife), and Thanka paintings. How can I book the trip & payment terms? You can book the trip through our website, phone, or via email. It is always a good idea to book your trip in advance because some of trekking regions we need reserved the domestic flight and we accommodate last minute bookings also even you arrive and want to organize. About the payments terms you need to pay 20% of total price as advance deposit to confirm reservation before arrive to Nepal after remaining balance of the payment shall be paid when you arrive to Kathmandu. Who will come to receive me in the Airport? Our representative will be there at airport to receive you with your nameplate who will carry your luggage and place it to private vehicle and then he/she will drop you to the booked hotel where your tour leader will be waiting you for a meet. And, also be aware that when you proceed out of the Airport, some Nepali carriers might try to help you to carry your luggage, and ask you for a tip. So you need to say 'Not needed' and wait to find our representative. How are the toilet facilities and washroom/shower facilities during my travel? You will find good toilet facilities in the lodges and hotels and you will get to shower and wash your hair in hotels/lodges where you will stay. Our tour leader will orient you about all thinks when you reach here in detail too. What are the time zone and phone code in Nepal? Nepal Standard Time (NPT) is the standard time zone for Nepal. With a time offset from Coordinated Universal Time (UTC) of +5:45 all over Nepal, it is one of only three time zones with a 45-minute offset from UTC.16.